← The Cement Garden: Imitation or Isolation? So P. suggested that N.’s suggestion of Javier Cercas’ Anatomy of a Moment might have been an instance of 10-10-12 sabotage. Here I am, seven books from the end, and N. suggests at 450 page (dense) history of the 1981 failed Spanish coup. And I, ever the sucker for recommendations from those I trust, took the bait. Almost two weeks later I’ve finished the thing, so glad I read it, so glad for the recommendation, but not entirely without suspicion. Were these two weeks meant to be gobbled up in order to thwart my success in 10-10-12? Was N. in cahoots with others? Did reading a book detailing the myriad of motivations for taking down a leader leave me deeply suspicious of everyone around me and feed in to my paranoia that other people care less about this reading project than I do? Maybe. That said, I’m glad I didn’t exchange Anatomy of a Moment for another, much shorter, much more accessible book, in the interests of a speedy read. Because this book needed to be dense, and does so very well in the layering of character, plot sequence, motivation and thematic interest. What, who, and how, does pure politics operate? What investments do public figures have in their legacy? What separates the historical from the fictional (not a question I’m indifferent to!)? For what ought we to blame the leaders of the coup? Anything? What counts as loyalty? What/Are there limits to the function of (the) image in politics? The book opens and closes with the consideration of Adolofo Suarez’s decision (was it a decision?) 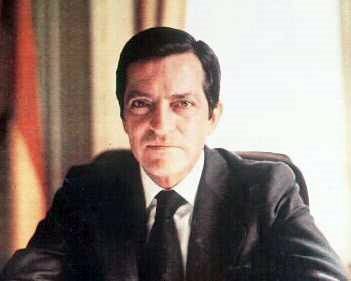 not to cower under his seat when the leaders of the coup entered the Spanish Cortes on February 23 1981. Why, Cercas, asks does he remain in his seat? From here, the book widens its scope to consider why General Mellado and Santiago Carrillo also remain in their seats. And then from there, widens further to consider the likely suspects for orchestrating and supporting the coup, and what motivated them. This organizational decision – to focus on characters rather than a chronological sequence – was at first a little disorienting. I felt, perhaps, that I lacked enough basic Spanish history to make sense of the scenes – not knowing enough about Franco, or missing enough of a grounding in Communist history – but as the book unfolds by way of intensive character (and institutions, too, I suppose) studies, these historical threads come together and the disorientation dissolves. “Sometimes you can be loyal to the present only by betraying the past. Sometimes treason is more difficult than loyalty. Sometimes loyalty is a form of courage, but other times it is a form of cowardice. Sometimes loyalty is a form of betrayal and betrayal is a form of loyalty. Maybe we don’t know exactly what loyalty is or what betrayal is. We have an ethics of loyalty, but we don’t have an ethics of betrayal. We need an ethics of betrayal. The hero of retreat is a hero of betrayal” (237). Finally, I didn’t believe N. when he told me I was reading a translation. Anne McLean has does a simply tremendous job with the translation. Granted I don’t know Spanish to compare it with, but I do know that this book has an exquisite tone and voice, so in my mind, she’s done very well.